The Uzbeks are the titular nation of the CIS member state Uzbekistan. They also live in Moscow, St.Petersburg, Samara, Tomsk, Irkutsk, Kemerovo oblasts. The Uzbeks have traditionally been divided into clans or tribes, and this division is still strong in rural areas. Language: Uzbek, many dialects, related to Turkish group . Heavily influenced by Persian (Farsi). Religion: Sunni-muslims, influenced also by Sufism and local beliefs. Diaspora: Tajikistan, Kyrgyzstan, Kazakhstan, Turkmenistan, Ukraina, Afghanistan (North), China (Sinkiang province), Turkey, Germany and USA. The historical origins of the Uzbek people are obscure. It seems that they got their name from Uzbek Khan of the Golden Horde, who ruled the lower reaches of the Volga river basin in the 14th c. He was so popular that many of his followers adopted his name as a clan designation. Eventually, some of their descendants drifted eastwards into Central Asia, where they merged with other groups and formed what we now know as the the Uzbek ethnic group. The territory of present-day Uzbekistan has housed advanced civilisations for millenia. The first notable civilisation was perhaps that of the Sogdians, who were master traders on the Silk Road and established the famous cities of Samarkand and Bukhara. From the 6th c., the area was dominated by the Turks, until the Arabs penetrated into the area in the early 8th c., bringing with them Islam. Towards the end of the 9th c., the Arab influenced waned, and the void was filled by the Persian Samanid dynasty, until the region again fell under Turkic hegemony. Eventually, a Turkic Islamic empire (the Khivan empire) was created with Samarkand as its capital city. The empire didn't last so long, however, as the Mongols conquered the territory in the 13th c. The conquest, it is being claimed, actually started as a punitive campaign against the Khivan empire because of its leader's bad habit of executing Gengis Khan's envoys, but didn't stop until even Kiev and Moscow were taken. In the 14th c., another great empire emerged in the area, under Timur Lenk, who claimed descent from Genghis Khan. He built an enormous empire, centering in Samarkand and Bukhara, which under Timur became centres of art and sciences, and two of the world's most beautiful cities. This was the beginning of a Golden Age of Central Asian Culture. The Uzbeks, then a warlike confederation of Turkic tribes, migrated into the area at the beginning of the 16th c., and put an end to the dynastic legacy of Timur as they captured Samarkand in 1512, and soon controlled most of the territory of modern Uzbekistan. The conquered area was then divided into three distinct states, Bukhara, Khiva, and Khokand. For the next 300 years, the Uzbek state functioned as a trade link between Russia and China. The Russian empire expanded south- and eastward throughout the 16th and 17th c., and by the middle of the 19th c., the Russians had embarked on a military conquest of Central Asia. Khokand, in the fertile Fergana Valley, fell to Russia in 1853, and subsequently became (together with much of present-day Kazakhstan) "Russian Turkestan". Bukhara and Khiva became vassal states under the tsar. The Russian conquest brought with it an influx of Russian settlers, along with railways, Russian Orthodox missionaries. According to the needs of European Russa, agricultural emphasis was shifted from grain production to cotton. This trend was later to be intensified by the Soviets, eventually having catastrophic consequences for Uzbekistan's environment, especially in the Aral Sea region. In 1898, a revolt broke out in the Fergana Valley, under the Sufi adept Muhammed Ali Khalfa. He called for a holy war, jihad, against the Russians, and his men killed more than a score of Russian troops before Khalfa was caught and hanged and the revolt was crushed. In 1905, the revolution that took place in European Russia, had its counterpart in Bukhara and Khiva, where a group of young radicals called the Jadids (Uzbek for "new method") sought to reform the Islamic society. In the 1920s, many Jadid intellectuals joined forces with the new Communist regime, only to fall victim to Stalin's purges less than ten years later. In 1916, towards the end of World War I, the Russian tsar introduced a military draft in Central Asia to increase Russian troop strength. Until then, Muslims had been exempted from military service. The military draft spurred another jihad, which brought considerably more casualties and was far more widespread than the one in 1898. It was still going on at the outbreak of the Bolshevik revolution. The Bolshevik revolution actually reached Tashkent (today's capital of Uzbekistan) before it reached St. Petersburg and Moscow. A coalition of Bolsheviks and other revolutionaries took power there in September 1917, and established soviets in the many of the biggest cities. Most Muslim leaders welcomed the change, accepting at face value the Bolshevik resolutions on the right of all nations to form independent states. In 1924, Uzbekistan was established as a Soviet Socialist Republic (SSR), at the same time as Turkmenistan. Until 1929, Tajikistan was part of Uzbekistan as an autonomous republic. In 1936 the Karakalpak ASSR was included in Uzbekistan, and since then the borders of Uzbekistan have remained relatively constant. The Stalinist Period brought serious threats to the indigenous culture, especially in terms of religion. Until World War II, strict measures were taken to inhibit communication with the rest of the Muslim world, most mosques were closed and the native Communist elite was purged. During the war, however, Stalin had to adopt a more conciliatory attitude toward religion, to be able to keep his empire together. Islam was recognised in the form of an "official Islam", administrated by four "Muslim Spiritual Boards" within the Islamic areas of the Soviet Union. The Board for Central Asia was placed in Tashkent, and was held to be the most influential of the four. Stalin retained his moderated position also after the war, but a new and bitter repression of religion started under Khrushchov. Only around 400 mosques remained open, compared to 26,000 in 1910, 1,300 in 1928 and between 3,000 and 6,000 in 1945. Leonid Brezhnev somewhat changed the Soviet attitude toward Islam. He started to employ Islam as a tool of Soviet foreign policy, especially in the Middle East, allowing Muslim leaders to travel, and hosting numerous conferences in Central Asia. A few new mosques were opened, too. In the 1980s, Moscow's approach was again anti-Islamic, as a result of the Iranian revolution and the war in Afghanistan. Gorbachov at first continued this policy, but gradually his glasnost and perestroyka policies gave more room for Uzbek nationalist policies. Uzbekistan declared independence in June 1990. 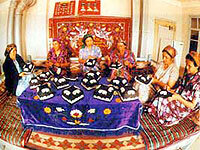 The next year, Uzbek was recognised as official language. The Soviet era had a disastrous effect on Uzbekistan's environment and on the health of the Uzbeks and other nationalities living there. The obsessive drive to produce cotton at the expence of other crops, with excessive use of chemical agents and overuse of water for irrigation, has devastated the whole region around the Aral Sea. In some districts, up to 80% of the population suffer from cancer and various blood disorders and infant mortality exceeds 10%! The combination of poverty, environmental destruction, ethnic rivalries and disintegration of Soviet authority has led to violent confrontations.